Frozen oven chips are fine, if you don't have any fresh potatoes in the cupboard, but after a while you can get bored of them. And, at around anything between £1 and £2 a kilo, they can be expensive too. I was also surprised to find out that, during my Gluten Free blogger week, that my oven chips were not just potato and oil as I'd assumed, but also contained wheat. Buy yourself a bag of potatoes and make them yourself - you'll be surprised at how much more flavour they have made from fresh and you'll also know what you're putting in there. Ready in 25 minutes, too! Perfect, hot from the oven, with a scattering of sea salt flakes and ground black pepper. Turn your oven up to 220ºC. While that's heating up, cut the potatoes into thin chips, placing them into a bowl of cold water as you go, so they don't turn brown. When you've chipped all your potatoes, drain the water and rub the chips well, inside a clean tea towel. Next, scatter them out onto a wide, shallow baking tray all in one layer - line it with greaseproof paper to stop them sticking. 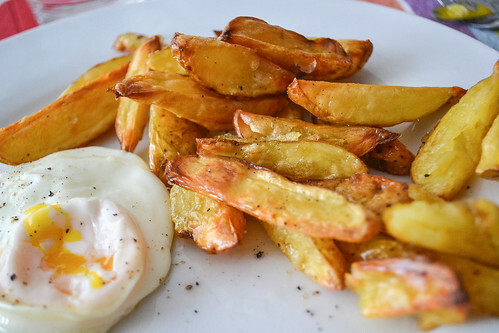 Drizzle over the olive oil just to coat the chips and toss them with your hands. Sprinkle over the sea salt flakes and slide into the hot oven. Bake for 20-25 minutes, until the chips are golden and hot. What do you think goes best with chips? Garlic mayo? Fried egg? Baked beans? Let me know what you like with your chips! garlic mayo every time... love your oven chips, they're very similar to mine... so delicious! These oven chips look so beautifully golden brown and really crisp.